"To tell the life of Thomas More is no easy task. Erasmus said that he was not competent to portray More’s many-sided character; and where that subtle, mighty intellect felt abashed, a modern biographer may well fear to tread." 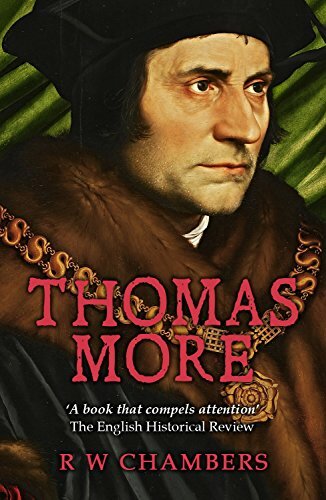 Thomas More was born on 7 February 1478. Throughout his childhood he spent time in the household of John Morton, Archbishop of Canterbury and despite considering becoming a monk, he instead went on to become a lawyer at Oxford University like his father. A Renaissance humanist, now venerated by Roman Catholics as Saint Thomas More, he was a ‘man for all seasons’. From 1510-1518 he was one of Henry VIII’s most faithful civil servants, entrusted with acting as secretary, confidant, interpreter and speech writer. He was later knighted, became the speaker of the House of Commons and chancellor of the Duchy of Lancaster. Throughout this time, More was also becoming a scholar in his own right, developing his own philosophies and maintaining a close friendship with Erasmus. His famed satire, ‘Utopia’, portrays a fictional island society that was greatly at odds with the realities of European politics in the last age of English medieval Catholicism. It was this work which would later form a large part of the trial against him. In 1535, More was executed on Tower Hill for alliances with the pope, criticism of the establishment of the Anglican church and condemnation of Henry’s divorce from Catherine of Aragon. A contentious and controversial figure, More died ‘for the right of the individual conscience, as against the State’. His place in history and the vastly turbulent period he lived through provide a rich and sensational narrative for readers and scholars alike. Raymond Wilson Chambers was a British literary scholar, academic and author. Associated with University College London, he studied under W. P. Ker and A. E. Housman and later served in WWI. He was a friend of J. R. R. Tolkien and went on to become Quain Professor of English at UCL. Chambers is known for his writings on a wide range of literary, historical and cultural subjects including Widsith: A Study in Old English Heroic Legend, Ruskin (and others) on Byron and Chapters on the Exeter Book. Thomas More was awarded the James Tait Black Memorial Prize.